Today I’m thrilled to be chatting with Marcia Meara; author, generous blogger/interviewer and a thoroughly lovely person. Judith: Tell us a little about yourself, as a writer and as a person. MM: I live in central Florida, just north of Orlando, with my husband of 30 years, four cats, and two dachshunds. When I’m not working on my books and blogs, I spend my time reading, gardening, and enjoying the surprising amount of wildlife that manages to make a home in our suburban yard. Birds from hummingbirds to bald eagles show up here frequently, along with black racers (harmless, graceful snakes), raccoons, possums, various lizards and skinks, and of course, the dreaded, bird-feeder raiding squirrels, which I consider minions of Satan, sent to plague me. JB: Tell us a little about your writing history/background. What inspired you to write? How did you come to writing? What is your main reason for writing? MM: I made it all the way from age five to my last year of high school, assuming I was going to be a writer. Then, my parents announced they had other ideas, and that ended that. I got a business diploma, went to work, got married, raised a family, and occasionally, wrote poems just for my own enjoyment. I never took a writing class, nor went to college, but I’ve read voraciously, all my life. When I was 69, I was lamenting that I had never pursued my dream of being a writer, and I was told to stop whining, go home, and write. So I did. That very day. I write because I love it more than anything I’ve ever done. And because I want to make up for all the years I lost while doing other things. Not that the other things weren’t worthwhile or important, but rather that they just weren’t writing. And writing is what my heart has always wanted to do. Summer Magic: Poems of Life & Love is a collection of contemporary poetry about exactly that–life and love. Summer Magic was the second book I released, a little chapbook of poetry. The first half is a series of poems called “Mac at Ten,” and they all focus on MacKenzie Cole (the main male character in Wake-Robin Ridge) as a young boy, spending his summers on the Ridge. The second half is a collection of various sorts of verse, on a variety of topics. MM: I didn’t think about genres when I wrote my first book. I knew exactly the story I wanted to tell, because it had been in my head for close to ten years. So I told it. And then decided Romantic Suspense was the best fit, although you could certainly call it a ghost story, as well. JB: How did you come up with the titles of your novels? MM: With Wake-Robin Ridge, it was fairly easy. The book is set in the mountains of North Carolina, and the wake-robin is a spring flower (a wine-red trillium, actually) that carpets the forest floor for a few weeks every year. I’ve always loved it, so I named my fictional mountain ridge after it. Swamp Ghosts was a perfect title for a book set along the St. Johns River basin of central Florida, and featuring several ghostly animals (metaphorically speaking). Finding Hunter is the second Riverbend novel, following up on Swamp Ghosts, and it’s about a damaged man who loses his way after his nightmares come true, and the woman who refuses to give up on the power of their love. And my work in progress, Book 3 of the Wake-Robin Ridge series, is about the legend of the Black Dog, as an omen of death, and is called Harbinger. That’s what he is, so that worked for me. JB: Tell us about the concept behind your books. How did you get the idea? MM: To keep it shorter, let me break this down by book. 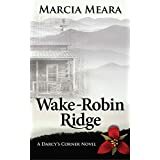 Wake-Robin Ridge: On my mountain rambles, I used to drive by an old, deserted cabin that looked like it could have some interesting tales to tell. So I decided to use it as the basis of my first book. My story features two different women who lived in the cabin nearly 50 years apart, and whose lives intersect in a dramatic and frightening way. 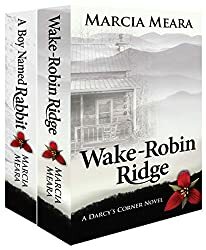 A Boy Named Rabbit: I discovered I wasn’t done with the folks who lived on Wake-Robin Ridge when the heroine whispered in my ear one night that there was a little boy alone in the wilderness who had a story to tell. I got up in the morning with Little Rabbit fully formed in my mind, knowing he was a remarkable child with the power to change the world for everyone he meets. Swamp Ghosts: I knew I wanted my second series set in Florida and to feature as much wildlife and habitat as possible. I was on a river eco-cruise when it occurred to me that my heroine was steering the boat. The good captain and her wildlife photographer husband morphed into Maggie Devlin and Gunnar Wolfe, an unlikely couple who discover that the most dangerous animal in the swamps walks on two legs, and that a serial killer is on the loose in the sleepy little town of Riverbend. Finding Hunter: For the second book in the Riverbend series, I wanted to feature the quirky and eccentric Hunter Painter, Gunnar’s best friend, and the idea that two people may have been in love with each other for many years, with neither the wiser. Enter Maggie’s best friend, Willow Greene. That took care of the romance part. For the drama, since a town of 6,000 souls can only have so many serial killers, I focused on the terrible damage a dysfunctional family can cause, through lack of communication and total denial problems brewing. When the inevitable happens, it sweeps Hunter along in its path of destruction, and leaves him a lost and desperate man. JB: Who are your favourite and least favourite characters? MM: Easy. My favourite character (so far) in all of my books is Little Rabbit. That boy constantly surprises me with the things he tells me to write down, and he’s a joy to have living in my head. A close second, btw, is Hunter Painter, because I can’t resist a damaged, angsty man. (At least in fiction!) My least favorite character would have to be Lloyd Carter, a mean-tempered, stone-cold killer, though I’m thinking by the time I’m done with Harbinger, I may have a new candidate for that spot. JB: What are the best and worst aspects of writing? MM: Best aspect is the pure joy of telling stories that have been rattling around in my head for years. I start typing at the beginning and don’t stop until the tale is told, and I love it. Worst aspect is self-marketing. I find myself resenting the time it eats up, since it steals it directly from my writing time. The second worst aspect is that people tend to think writing isn’t really work, and writers should be free to do all sorts of other stuff during the day. I figure I don’t have decades left to tell my stories, and consequently, I need to write like a thing possessed before I fall face down on the keyboard. Eeek. JB: How do you balance marketing one book with writing the next? MM: Balance? What is this thing you speak of? I’m afraid I’m listing to the starboard bow, and likely to capsize at any moment. Balance, indeed. JB: What do you do when you don’t write? MM: I love to garden, birdwatch, and read, not necessarily in that order. I also love spending time with my two grandchildren, Tabitha Faye, and Kaelen Lake, who make my heart happy. Giggling is good for the soul. JB: Tell us one odd thing about you and one really mundane. MM: I love reptiles, especially snakes. Even more than birds, and almost as much as cats. And I also love eggs, no matter how they’re cooked. JB: Who would you like to invite for dinner? MM: LOTS of folks. I’m very sociable. But I’d especially love to have dinner with all my beta readers, most of whom I’ve never met. We’d have such a good time! And you, of course. Why not? Barring that, could I please have dinner with Chris Hemsworth, in full Thor regalia? That would make my day! Or maybe my LIFE! JB: What are you working on now? MM: Harbinger: Wake-Robin Ridge Book 3. It focuses on the Appalachian version of the legend of the Black Dog, or Harbinger of Death. JB: Is there anything you’d like us to know about you and your books? MM: Just that I came to writing very late in life. I wrote my first book, Wake-Robin Ridge, 2-1/2 years ago, at age 69. I’ve published three novels, since, and to have my fifth out by May. I have a deep love of nature, having worked for the Florida Audubon Society years ago, and I try to express some of that in my books. I love to learn new things, and to share them with others, and have begun doing presentations locally a couple of times a month, focusing on the wildlife and habitats of central Florida, writing in general, and a bit about my own books. JB: Which writer would you choose as a mentor, living or dead. MM: I think they’d be better at the whole mentoring thing if they were alive. *grin* (JB: “grinning back” )With that in mind, I’m going with my favourite Urban Fantasy writer, Jim Butcher. Toss in Neil Gaiman for general eccentricity, and Marisa de Los Santos for her poetic use of words, and I think I’d be mentored to a fare-thee-well. J If I did reach back to writers who’ve gone before, I’d choose Daphne du Maurier for her stunning use of descriptive prose, and her appreciation of the macabre, often culminating in endings impossible to predict. JB: Who is your favourite author living or dead? MM: Daphne du Maurier, since reading Rebecca at age twelve. JB: What is your advice to new writers? MM: Don’t let anyone tell you that you can’t write, but please study your craft, and the details of good grammar and decent plot structure. Never stop learning how to do it better. And most important of all, READ. All the time. All sorts of books. You can get a pretty good feel for what a book ought to sound like that way. Buy a copy of Strunk & White’s Elements of Style. Keep it close by. You’re going to need it. And hire the best editor/proofreader you can afford. Trust me. You don’t see your own mistakes, because your eyes read what you think you’ve written, instead of what’s actually on the page. Even with editors, proofers, and beta readers, some things can still get by. When you find them, fix them. Readers notice. JB: What would your friends say are your best and oddest qualities? MM: Hmm. Depends on which friend you’re talking to. I think most would say I’m smarter than the average bear, which is true in SOME areas. Little do they know I’m also dumb as a rock in others. As for oddest, there are too many to choose from. Some of my friends think my love of snakes is a contender for first place. Could be they’re right. JB: How do you handle criticism of your work? JB: Thank you, Marcia, for making this interview so much fun. Thank you so much for this opportunity to chat with you and your followers, Judith. I appreciate it very much, and your thought-provoking questions have been a lot of fun. FIND MARCIA HERE: She’ll be pleased to greet you. This entry was posted in blogging, Books, contemporary womens'fiction, interviews, Uncategorized and tagged #blog, #womenauthors, A Boy Named Rabbit, authors, Finding Hunter, Marcia Meara, Summer Magic, Swamp Ghosts, Wake-Robin Ridge:, X #SaturdayBlogShareX A Boy Named RabbitX AuthorsX blogsX booksX contemporary fictionX Finding HunterX Harbinger: Wake-Robin Ridge Book 3.X interviewingX InterviewsX Marcia MearaX readersX ReadingX Sw by Judith Barrow. Bookmark the permalink. Thanks again, Judith. Being here was a pleasure. Wow! What a wonderful interview with an amazing woman. I’m overawed at how many books she’s produced in such a short space of time. I lvoed the story about being told at age 69 to go home and write. Brilliant. Thanks to you both. Terrific interview, Judith 😉 Marcia is a treaure and an inspiration. Plus, rumor has it she wrestles large albino aligators, so she’s a true force — on and off the page! Thanks for featuring Marcia on your blog, Judith. I once told Marcia she’s “endlessly fascinating,” but I don’t think she believed me. This interview proves I’m right! Glad you enjoyed the interview. It was a lot of fun. Great interview Judith, Marcia is a talented author, great supporter of others and a true inspiration, long may it last. Wonderful interview, ladies 🙂 and lovely to find out more about Marcia. Thank you, Cathy! It was a fun interview to do, and I really appreciate Judith having me. Thanks, Olga. So glad you enjoyed it. Judith asked some fun questions, so it was a pleasure to answer them. And a treat to be featured on her blog, as well. Great interview and a lovely insight into MM aka Marcia Meara. An enthusiastic person, an example for all of us! Thanks for dropping by Carmen, I agree. Aw, that’s sweet, Carmen. I’m just trying to accomplish as much as I can before I shuffle off this mortal coil. And I’m so glad I’ve been given an opportunity to write, after all these years. Thanks for your kind words! AH-HA!!! Now I know your REAL name, and can quit calling you “Let’s.” Whee. And thank you so much for saying such nice things. I don’t think I’m very awe-inspiring, but I do love what I’m doing these days, and really enjoy sharing with others. So glad you enjoyed the interview. Lovely interview, ladies. Lots of answers made me smile. Many others had me nodding in agreement, particularly the advice for new authors. Hi, Wendy. I’m glad you were nodding and smiling. Especially smiling. I love to see folks enjoying things, and if I can get a laugh out of someone, it makes my day better! So glad you enjoyed the interview. It was a lot of fun! So glad you enjoyed it, Deb. Judith made it a lot of fun, and I enjoyed doing it so much. As always, thanks for your kind words. You ROCK!